Join Music City Pub Crawl for our annual St. Paddy Clover Crawl. This holiday event is much larger than our traditional, daily tours. There may be as many as 300 on the pub crawl. There are little or no stories, but we still have games, activities and drink specials at 7 bars. This pub crawl puts more emphasis on socializing and celebrating everyone being Irish for the day. $15 includes drink specials, swag, souvenir koozie, games/prizes and other surprises. 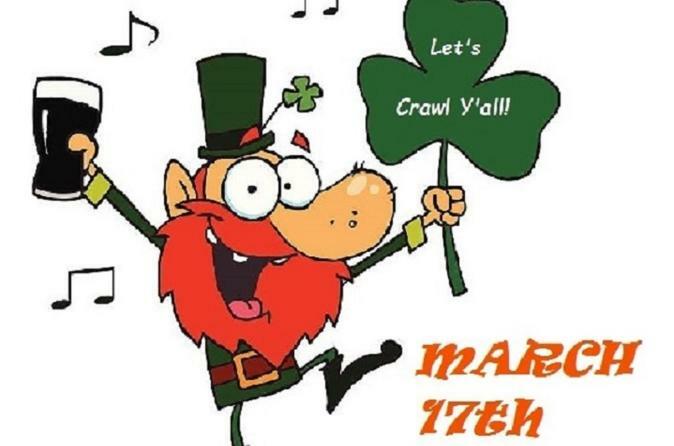 The Clover Crawl takes place on Saturday, March 17th from 2:30-6:30 PM Registration ends at 3:30. Tose arriving late can get a map at Buffalo's Bar to join the rest of the group.. Buffalo's Bar is located at 154 2nd Ave. N. Stop by 7 bars along historic 2nd Avenue, including Buffalo's, Benchmark, Big Shotz, Doc Hollidays, Famous Saloon, Cerveza Jack's and Wild Beaver. The event will end at Wild Beaver Saloon. Guests must be 21+ to participate; all bars will card so make sure you have your ID on you. All International guest should bring their passport for ID. Guests will be given a map of bars along 2nd Ave along with featured drink specials. There will be plenty of guides to keep the group moving along, but this is not a guided pub crawl, per se. Guests are encouraged to roam from bar to bar at their own pace.